Why add A5 to our range of Generics? In response to recent demand for A5 size EZIPOPs, we added this size in a universal style (Generic) for those who have a need for smaller quantities than can be effectively custom printed. We're keeping this size in stock for immediate delivery and we've been pleasantly surprised by the initial orders. With over 70% of purchase decisions being made at Point Of Purchase (POP), getting noticed is partly about looking different and where most brochures and promotional material are trifold or DL size, an A5 brochure offers a point of difference and importance from the norm. A5 brochures measure 148.5mm wide x 210mm high. That's approximately 5 3/4" wide x 8 1/4" high. [The same height as the more common DL or trifold but almost 2" or 50mm wider]. Shown here at right, is a picture of an empty A5 Generic EZIPOP. 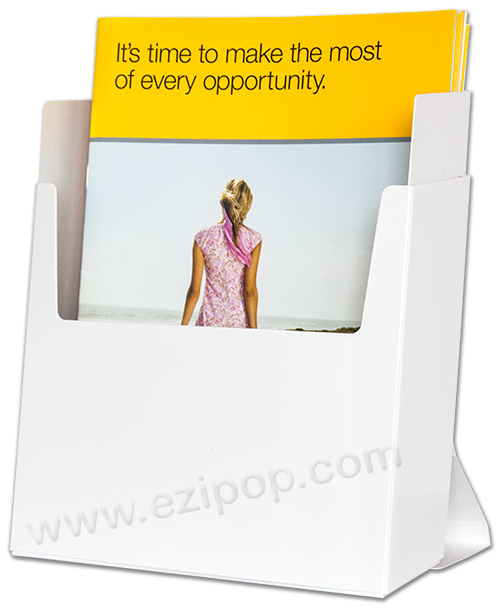 Like all EZIPOPs, they pack and ship flat, they're easy to erect and fill with brochures, then pop up when required to display your information. This size is sometimes used by institutions such as banks, DIY suppliers and pharmaceutical companies but has become more commonly used by others looking for something different. Using our Generic A5 EZIPOPs to display your brochures makes a lot of environmental and economic sense. They're made from special high strength cardboard which is manufactured using pulp that's FSC, PEFC and SFI Chain of Custody Certified. It's also certified ECF (Elemental Chlorine Free) and it's fully and easily recyclable. It's even certified safe for human food contact. 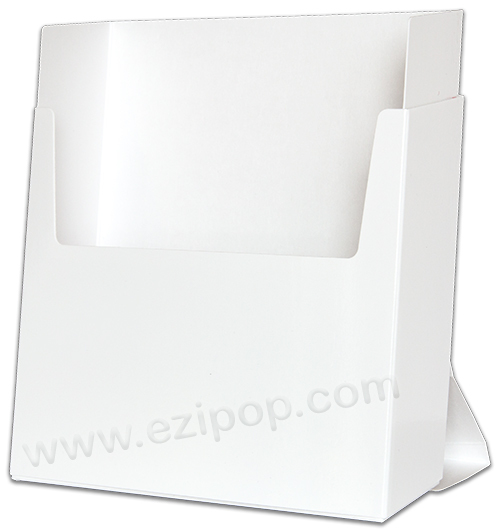 A5 Generic EZIPOPs are considerably less expensive than plastic alternatives and are easily branded with a front sticker. (We can help with this if you aren't sure). If you would like pricing and other information, please just go to our request a quote page and fill in the details. Pictured here at right, is one of our new Generic A5 EZIPOPs with an A5 brochure displayed. This example doesn't show a front sticker but as soon as a client sends us a photo of how they've labelled their units, we'll post it. EZIPOPs feature a unique and patented two sleeve sliding action with pop out rear strut. The double layer construction together with the high strength board we use, makes them strong and durable. The ability to ship flat saves on transport and distribution costs too. If they are dropped, they won't shatter or crack and their low weight saves fuel. And you can order as few as 10 of these via our request a quote page. Got a question? Not ready for a quote yet? Just want to contact us for any reason? Please go to our contact us page. If you would like to find out more about our most common DL size Generic EZIPOPs, just click here to go to our web page. You'll see an example there of how a client used a front sticker to effectively personalise their Generics.